Since I’ve been on a fierce kitty fashion statement kick this week, why not keep the party going? And since the Jordin Sparks/Whitney Houston remake of Sparkle launches tonight (featuring the haute coiffures and couture of the 1960s), I thought I’d share my favorite way to create a smoking hot CAT EYE! 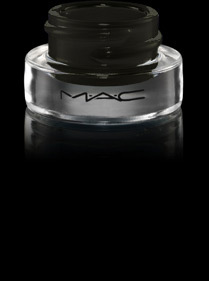 MAC’s Fluidline in “Blacktrack” ($15) is perfect for adding a touch of mystery and glamour to your makeup routine. The product’s long-wearing gel formula has a smooth finish and is difficult to mess up. I recommend using an angled brush for precise application. MAC’s Small Angle Brush #266 ($20) has super-soft bristles and works perfectly! Lightly dab the brush into the pot to deposit color and apply slowly along the lower edge of your upper eyelids. If your hand is steady, you can apply in one continuous motion, following the curve of each eyelid. If you’re a novice, leaning toward the mirror and tilting your head back may help. Make the line as thick as you prefer; the eyeliner is easy to remove. For extra flair I angle the brush when I reach the far edge of my outer eyelid to create a slightly upturned swoop, but the end shouldn’t extend past the outer point of your eyebrow Allow the liner to dry; remove any smudges and stray flecks of product with a moistened Q-tip. Fashion flashback: check out this clip of the original Sparkle, featuring Lonette McKee and Irene Cara!